This " Lake Castle Estate" has been featured in many Books & Magazines. 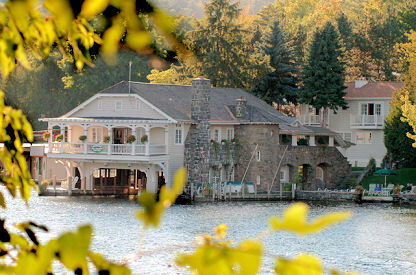 The only B&B in the Waters of Lake George is the former home of " Gold Cup" winner George Reis. Seven outstanding rooms & suites , some with fireplaces and two person whirlpools. Built in 1917 as the summer home of speed boat racer and gold cup recipient George Reis, the term "boathouse" does not do it justice. This famous and unique Bed & Breakfast has been featured in Adirondack Life, Motor Boating and Sailing, The Great and the Gracious, Adirondack Style, and Unique Homes.